First off, I love that Cray still refers to themselves as the "Global supercomputer leader." Forget a clinical, technical name like "high-performance computing experts," or "memory-intensive research device" etc. Just go with SUPERCOMPUTER. Why not. This morning, Cray announced that they would be launching their own version of "cash-for-clunkers." SEATTLE, WA--(Marketwire - 11/17/09) - Out with the old and in with the new. Global supercomputer leader Cray Inc. (NASDAQ:CRAY - News) today announced its own take on the U.S. government's recent "cash-for-clunkers" program by launching a new buy-back program for installed or used clusters or workstations. 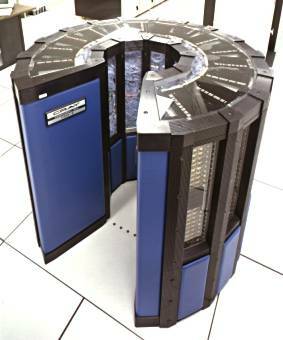 Cray's "cash-for-clusters" program allows workstation and cluster users to trade in their current systems for credit towards the purchase of a new Cray supercomputer. "With a nod to the popular 'cash-for-clunkers' auto program, our 'cash-for-clusters' buy-back program gives workstation and cluster users a financial incentive to free themselves of their outdated systems," said Ian Miller, senior vice president of the productivity solutions group and marketing at Cray. "Simply give us your old workstations and clusters from any vendor, such as SGI, HP, Sun, IBM, Appro and Verari Systems and we will give you top dollar as a trade-in towards the purchase of a new Cray supercomputer -- it's as easy as that." Participants in the program can apply their trade-in credits towards the latest in high performance computing systems from Cray, including the Cray CX1(TM) deskside system, the CrayXT6m(TM) midrange system and the industry-leading petascale Cray XT6(TM) supercomputer. To qualify for the program, the trade-in system must be a cluster or high-end workstation between two and four years old, have been under a continual maintenance agreement since original delivery and still be in working order." In a tough environment, Cray is being creative in its promotions. The shares are off 4% today, as people recognize that this deal will hamper selling prices and gross margin. But the company wouldn't be doing this unless sales were at risk of slowing further. This promotion will speed up the "replacement cycle" for Cray's products, and definitely engender some good public relations with clients.